Lineup: BJ Upton appears to be healthy. The only real question is left field. Carl Crawford won’t be ready to start any games for at least the first round. Has Fernando Perez left enough of an impression on Joe Maddon to be the starting left fielder? We say Yes, but won’t be surprised if Eric Hinske gets a start or two. Hinske could also spell Gabe Gross in right one game. Look for Rocco Baldelli or Willy Aybar to be in right field against lefties, with the other at DH. Bench: The Rays will most likely go with a 11-man pitching staff, giving Joe Maddon one extra player on the bench. Ben Zobrist, Willy Aybar and Rocco Baldelli are locks. That leaves two spots. One must be a backup catcher and it looks like Joe Maddon trusts Michel Hernandez, based on his defensive skills. For the final spot, Eric Hinske has struggled in the second-half, but is Maddon ready to give a roster spot to a guy (Carl Crawford) that will be limited to pinch-running and late-inning defense? Maybe, but Maddon loves flexibility and Crawford makes the bench less-flexible. Of course, this all means that Justin Ruggiano, Jonny Gomes and Dan Johnson will be left off the roster. We might understand an argument for Ruggiano in place of Hinske and Crawford, or in place of Fernando Perez, but neither scenario seems likely. Rotation: The Rays will only need 4 starters in the playoffs. And if the Rays play game 1 on Wednesday*, they would have 2 days off in the first 3 games and could conceivably bring the game 1 starter back for game 4. But with the depth of the rotation, we don’t see Joe Maddon going with a 3-man rotation. The top 3 are locks. Who is #4? Edwin Jackson has pitched very well in the second half. Andy Sonnanstine is capable of a dominating performance. What if David Price throws a 3-hit, 11 strikeout, shutout tonight? We give the edge to Jackson, but either of the others would not surprise us. The other question is who goes in game 1. As it stands now, James Shields is scheduled to pitch the final game of the regular season. And if the Rays need that game for the AL East title, he likely makes the start. If the Rays have clinched by Sunday, we suspect Jeff Niemann or Mitch Talbot makes the Sunday start and Shields will go in game 1, followed by Scott Kazmir and Matt Garza. Bullpen: Only 2 spots are question marks. Will Troy Percival be healthy enough to pitch? Joe Maddon will not hesitate to keep Percy off if Maddon does not think he is healthy enough. That leaves 1 spot which most likely goes to David Price. We just can’t make an argument for Juan Salas, Jason Hammel or Jeff Niemann. *The team with the best overall record in the AL gets to choose if they play game 1 on Wednesday or Thursday. The teams that start on Wednesday get a day off after game 1 and game 2, while the teams that start on Thursday only get 1 off-day in the first 3 games. A team with only 3 good starters would choose to start on Wednesday so they can utilize a 3-man rotation. The Angels would likely make the Rays start on Wednesday if the Rays are the Wild Card team. The benefit to the Angels is the quick turn-around leveled on the Rays going from Detroit to home to Anaheim in 3 days. If the Rays have the best record they would likely prefer to start on Thursday for the extra day of rest and knowing that the rotation is at least 4-deep. i just assumed Crawford AND Ruggiano were locks. But i had not idea how deep the team is right now. Nando has to be on. But hinske i think is in danger of being left off. he has sucked in the second half and the Rays don't have to worry about backlash as he is a free agent. i would keep Ruggiano and Nando, drop Crawford and Hinske. his starts as awful and 3 as great. awful and 3 as great. I do not see one factor that favors Jackson. You might consider Sonnanstine's second start vs. Boston as less than great as he only went 6 innings, but otherwise he was better than Edwin across the board. I like Jackson very much, and despite my skepticism about his performance do think he may be emerging as a useful pitcher. Projecting him is tough because a lot of his peripherals suggest he remains a sub-par pitcher, but it does seem to me he has developed much better mound presence and that may serve his well. Still, Sonnanstine has been the better pitcher, especially in the second half. i might have been too vague. as I have pointed out previously, Jackson has been very good since the beginning of August. Of course there are 2 horrible starts in there against the Yankees. But outside of that there are some very good outings for a #4/5 starter. You do bring up a good point. If you want to break it down by the competition, Sonny's 2 starts against a powerful Red Sox squad dwarf Jackson's 2 starts against a powerful Yankees lineup. I have no problem with Sonny being the 4th starter. Another factor to consider is both Maddon and Hickey in the past that they would trust Sonny out of the pen noting that he warms up very quickly and walks fewer batters. I think your dates are off on the playoffs. The first playoff game (at least according to the Rays website) would be Wednesday, October 1. The other ALDS game 1 is on Thursday, Oct 2. So the Rays would have an extra day as a breather following the last game with Detroit. good catch. not sure why i thought they started on Tuesday. Still doesn't change the extra day off for the series that starts first. I could be mistaken, but doesn't the addition of Ryu and Orvella to the big league 15-day DL on Aug 31st, (essentially making them 'eligible' for the postseason roster) allow us to have additional flexibility on the postseason roster a la K-rod's emergence in 2002? yes. that is how Price could still be added to the roster even though he didn't get promoted until after August 31. Perez was promoted on August 31 so he is already eligible. Friedman could also use one of the injury exceptions on Niemann and possibly Dan Johnson. but you still have to stay within the 25-man limits. Since it has been noted that Sonny would be a good long relief option, why not bring him along and leave someone else home. Like Percy. Or you could leave Miller off if you bring Price along (two left handers is all we've had all year long). I'd much rather have Andy than either of those two. It will be ridiculous if Sonny is left off the roster. Price has done nothing at this point as a Major Leaguer to get Sonny's spot. In my opinion, Garza should be left out of the starting rotation. He has been lackluster as of late. I'm not even sure Price deserves a spot over Niemann. Niemann was dominant in AAA the last month and in his outing as a closer while Price has not been. the only problem with leaving off Miller is Howell really hasnt been used as a lefty specialist at all this season and Price can't be a lefty specialist since Maddon wants his role clearly defined to give him ample time to warm up. Let's see how Price does tonight, and remember back in spring trainning Maddon's evaluation criteria, throw strikes! Sonny is a control freak, and has done it all season at the major leage level, Price has struggled a in the minors with his command. If Price makes the postseason roster I think it's because Percy isn't healthy. I saw Price pitch twice in person this year, in Spring against the Yankees and once in Vero (his last Single A game). I thought that he thrived in the one inning apperence role against the Yanks, and his volocity was not as dominate in the starting role. We'll see, and don't forget that Maddon has had Hammel all season, there is a trust there, and Hammel did a decent job as a strater, he still might be the better option as a long reliver when Howell isn't available. Hammel wouldn't shock me... this is really more about Price. 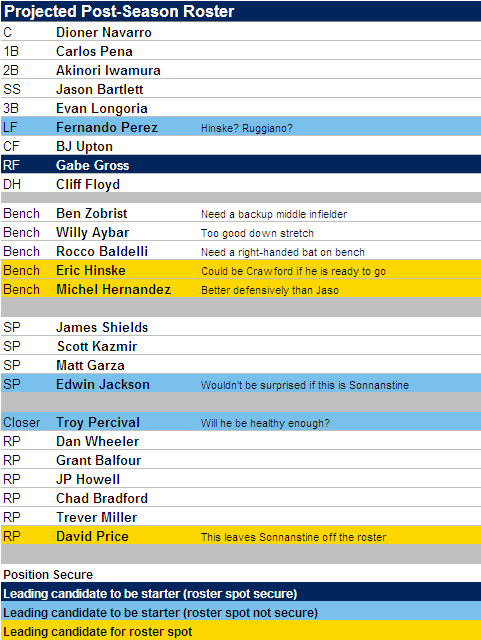 Assuming Percy is healthy...*If* Price is in, Hammel has to be the one out. I can't see anybody else. As for the velocity, that is likely by design. Kazmir can hit 95-96 if he only had to work 1 inning, but takes a bit off for the sake of endurance. My gut just says Price isn't even promoted if the team wasn't at least leaning towards having him on the postseason roster. It is his first pro season, why add innings to his arm if there is no benefit to the team? Then again, if the team wanted him as a 1-2 inning guy in the postseason, they sure are taking their time getting prepared for that role. I saw Price both in spring training and 3 times for Vero Beach. He had no command or control problems in Vero and as far as I can tell he had none in Montgomery either. He did stumble a bit in Durham. As for velocity, when I saw him in Vero he was sitting at 94-95 in the 5th inning and still hitting 96-97 that late as well. I saw no evidence of any dropoff as the game went on. He did vary his pattern a bit, moving to more sliders later, but still used the fastball most of the time. First of all I love that the discussion on here is good civil and backed if not by stats then points that make sence. Price looked prety good last night, left some pitches up that he got away with, and was taking advantage of what seemed to be a sizable strike zone. But he didn't hurt his case at all. On XM I heard Buck Martinez talking about Price (Buck is part of the O's TV crew) and said not to count out, if Price makes the Rays Postseason roster, that he might get a start if Maddon thinks it's a favorable matchup.